2009 is proving to be a landmark year for Psycatron aka Paul Hamill & Dave Lievense as they take things to the next level with a string of high profile productions being released on some of the world’s most respected labels, receiving props from some of the biggest names in the business and the sales flying high in the Beatport charts. The year began with the Location Unknown EP on Fergie’s Rekluse imprint. The lead track ‘Takefive’ was a huge smash at the Miami Winter Music Conference with everyone from DJ Hell to Sasha (who was closing his sets it with) making it one of the biggest records of the conference. From Belfast to Detroit is next, with the master Carl Craig signing ‘Deeper Shades Of Black’ for Planet E Communications making them the first Irish artist to appear on the Detroit imprint. ‘Deeper Shades’ spent 6 weeks in the Beatport Top 20 peaking at Number 5 with only Cirez D, Adam Beyer, Joris Voorn and Sebastian Leger standing in the way of pole position. 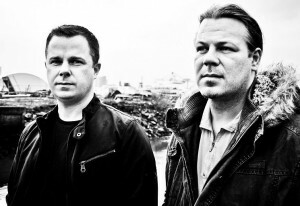 Then from Detroit to Sao Paolo in Brazil, where Christian Smith’s recently relaunched Tronic Music delivered the devastating ‘Directions’ and ‘Tipping Point’ with charts and plays coming in from everyone from Dubfire to Digweed to Dave Clarke who featured it heavily on his White Noise Radio Show. ‘Directions’ will be re-released with remixes later on in the year from Matt Nordstrom, Fergie & Reset Robot as well as featuring on Christian Smith’s new compilation for Renaissance. A bit closer to home and an appearance London based Simple Records demonstrated a deeper, subtle edge at the opposite end of the scale from their previous big-room releases with the ‘Orchestral Manouvres In The Park’ EP showing up on Will Saul’s highly respected imprint. As if the prove that getting signed to Planet E was no flash in the pan, Psycatron have recently signed a deal with legendary Belgian imprint R&S Records home to the likes of Aphex Twin, Joey Beltram and Derrick May who will release ‘Is What it Is’ in November. Further material is in the pipeline for Cocoon, International Deejay Gigolo, 1605, Tronic, Mija Records and Process. Having spent the past seven years hosting their residency at the world-famous Shine and the Stiff Kitten in Belfast where they’ve supported some of the biggest DJ’s on the planet, 2009 will be the year where Psycatron’s winning combination of killer DJ sets and live shows will see them emerge as one of the biggest Irish acts of the year as their profile continues to grow on a global scale. Psycatron are made up of BBC Radio DJ and producer Paul Hamill and superproducer Dee Lievense who has worked for every label under the sun from NRK to Plastic City.